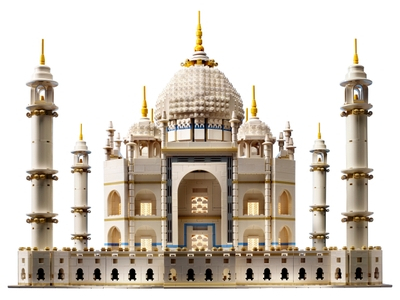 Recreate one of the world’s architectural wonders with this LEGO® Creator Expert Taj Mahal set. First released in 2008, this amazing LEGO interpretation of a structure regarded by many as the world’s most iconic symbol of love, has been relaunched to mark its 10 year anniversary. With more than 5,900 LEGO pieces, the model captures the grandeur of the huge ivory-white marble mausoleum, and focuses on the structure's elaborate facades with sweeping arches, balconies, arched windows and intricate detailing. Decorative finials top the central dome, subsidiary domed chambers and soaring minarets, and an ornate raised platform lined with recessed arches and detailed tilework around the base add the finishing touches to this magnificent model. Price is 15% below the initial Lego retail price, a € 49.54 discount! This comes down to 4.73 cent per brick. The Taj Mahal (10256) Lego set is available from the sites below. However, they do not offer delivery to your selected region. The Taj Mahal (10256) Lego set is no longer directly available from the sites below. However, 3rd party partners of these sites might still have the set available. Alternate description Discover the architectural wonder of the Taj Mahal!